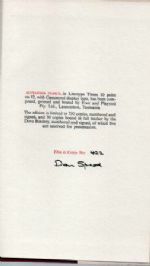 Edition Details: 1st Australian Edn. Hardback. SIGNED NUMBERED LIMITED EDITION. 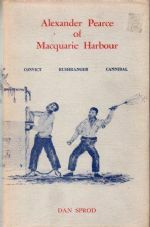 In this reasoned reconstruction, the exploits of the notorious cannibal-convict, Alexander Pearce, the Man-Eater of Macquarie Harbour and prototype for Marcus Clarke's Gabbett, are traced from his (partly unpublished) confessions to the penal authorities and by exhaustive reference to contemporary records of all kinds. Pearce's two escapes from the hated penal settlement in 1822 and 1823, the fate of his companions, his successful crossing of the mountains and adventures whilst ranging the bush are reconstructEd. The author succeeds in separating the truth from sensational legend and examines the factors which motivated Pearce's cannibalism and the convict's contribution to the exploration of unknown regions of the colony. Illus. + Map eps of Van Diemen's Land, Appendices, Notes and References, Bibliog. and Index. 175pp. 8vo. h/back. From the library of true crime writer, Wilfred Gregg, with his personal b/plate. Numbered Limited Edition, this being no. 422/750. SIGNED BY THE AUTHOR. F. in sl. sunned Nr. F. dw.